With the release today of Google Earth 7 for iOS on the Apple App Store, the Mountain View tech firm has beaten Apple to the punch. The latest iteration of Google Earth bring to iOS a huge feature that Apple is adding to its own mapping app with iOS 6: 3D images. With iOS 6, Apple takes control of mapping on its mobile devices by dropping Google and offering an in-house application instead. The 3D imaging on Apple's software is called "Flyover". But that is still a few weeks away and Google Earth 7 is available now. Google announced on Thursday that the 3D functionality of Google Earth 7 for iOS brings 3D to the same 14 regions that Android users were able to access starting in June. Those 14 regions include L.A., the San Francisco Bay Area, Boston and others. 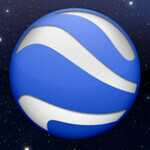 As Google adds 3D to more regions for its Android app, it will add the same regions for the iOS variant. Google is moving quickly to add 3D to more and more areas. By the end of the year, Google says it will have 3D coverage of regions covering 300 million people. 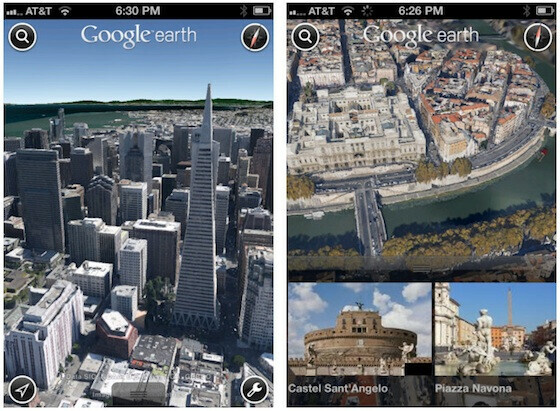 Google Earth 7 for iOS requires the user to have an Apple iPhone 4S, Apple iPad 2 and the 3rd generation Apple iPod or higher in order to see the 3D images. Older models can still use the app, but will not see the 3D images. Google making apps for Apple earns my respect. They still show Apple they can well operate together why Apple seemingly turns away from Google services. To Google it doesn't matter who is competition, as long as they keep making money and the profits keep rolling in, they don't care if their competitors earn more than them. iOS users represent a huge group of Google users. If Google can offer a compelling value proposition to those users, they will continue to use Google services. Lol the iPhone has lots of Google apps such as Search, Earth, Chrome, Translate, Gmail, Google+ and a few others. You don't see a single app from Apple on Android. That's one reason I think Apple is so anti-competitive. If PC's weren't popular do you really think Apple would make iTunes for Windows? All of those things were on iPhones before google became competition. They still have google search as default, still have gmail. I'm curious, what app could apple bring out for android? They would probably try releasing an app that would cripple the handsets and direct the user to by an ios device! iTunes, Quicktime and maybe a few others. That's why iTunes it the #1 place to purchase and play music. I say google should just focus on getting that Nav out of beta. It really makes me mad to see "beta" every time I use the app. They should finish that, then do something on iOS. Google Earth is neat, for 5 minutes, but then you start to wonder what use justifies such a large chunk of RAM. If they're going to give something to iOS, I'd rather see their mall, Costco, and other public venue floor plan app thing that android has. That's something I could use. Is that in Google Maps or a separate app? And through this all, Play Store on my Galaxy Note still only says Maps is on 6.9. Are certain phones allowed to see the 7.0 update, or is it specific to my phone? v. 6.9 for Android seems to have the functionality of v. 7.0 for iOS. Different numbering for different O/Ss? Confusing, but whatever. No, on the online Play store (which doesn't detect my phone) it says version 7.0. Online from your desktop? Or? The Play store application from my ICS (v. 4.04) says v. 6.9 but includes 3D in the product description. I've updated it, and it is also much smoother.